The Grand Street Theatre, at the corner of Grand Street and Chrystie Street, circa 1905. Image: The Museum of the City of New York. In the upcoming family program History Hunters: A Kid’s Life at Work, kids go back in time to discover what life and work was like 100 years ago on the Lower East Side. After hearing of this event, a friend of the museum was reminded of an excerpt from her father’s memoir. He grew up on the Lower East Side and wrote of his early teenage years working in a “a sign shop where they painted signs which advertised the motion pictures (or movies).” He describes the high demand for new signs in the bustling neighborhood, noting that he and his younger brother “each carrying at least 6 signs a piece, had to run like Olympic races in order to prevent the gangs from taking possession of the signs” before the delivery was completed. Sounds like hard work! 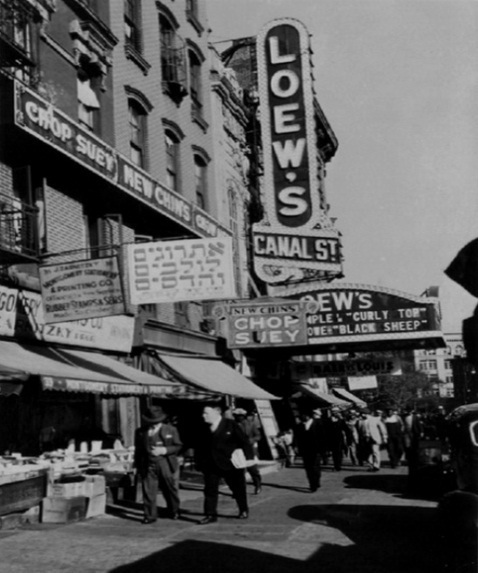 The story got us thinking about the history and prevalence of theaters on the Lower East Side. “Theatre” is the British English spelling and one most often used in the 19th and early-20th centuries (since that’s how these theatres spelled their own name, I’ll use the British English spelling in this post). One look at a map created by the organization Cinema Treasures shows the many theatres that once entertained the residents of the Lower East Side. In his memoirs, the former sign shop worker notes that “there were about 21 movie houses in about a radius of a mile from the sign store.” But today, according to the Cinema Treasures map, 32 of the 33 theatres identified on the Lower East Side are closed, and 13 are demolished. Many of these theatres were opened during the early- to mid-20th century and either showed legitimate or “legit” stage productions (a term which referred to live actors in mostly dramatic stage productions), moving pictures, or vaudeville. However, as suburban multiplexes began to open in the mid-20th century, theatres in the city began to dwindle. Let’s take a closer look at two of these theaters on the Lower East Side, The Grand Theatre, and the Loews Canal Theatre. Both of these theatres are closed today, however, after their final curtain their fates have been entirely disparate. The Grand Street Theatre, located at 255-257 Grand Street on the Lower East Side, circa 1903. Image: The Museum of the City of New York. 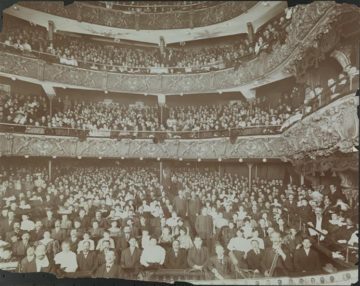 Inside the auditorium at the Grand Street Theatre, circa 1910. Image: The Museum of the City of New York. The Grand Theatre (also referred to simply as “The Grand”) opened in 1903 at 255-257 Grand Street, at the corner of Grand and Chrystie Streets. 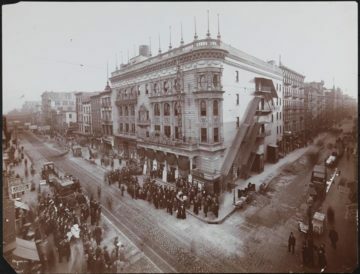 With its opening, The Grand became “the first theatre in America built for the express purpose of housing Yiddish productions.” An article published in The New York Times the week of the theatre’s opening entitled “A New Jewish Theatre,” remarks that it is “the first theatre in New York ever erected expressly and exclusively for foreign-speaking Jewish patronage of the better class.” The article then goes on to describe the theatre’s architecture, designed by Victor Hugo Koehler, proclaiming that it is a “handsome white stone structure – of the Renaissance style now prevailing at playhouses.” The Grand is also notable because it was the first theatre to be owned, run, and managed by the actors themselves. Judging by the mention of the “better class” in the Times article, we can imagine that this theatre, just a stone’s throw from the Eldridge Street Synagogue, would have catered solely to our historic congregations wealthy members. Early congregation leaders like banker Sender Jarmulowsky and kosher butcher Isaac Gellis would likely have attended shows here. 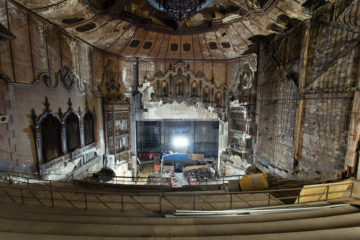 But the congregants who could only afford the “cheap seats” at Eldridge Street may not have been welcome at The Grand. 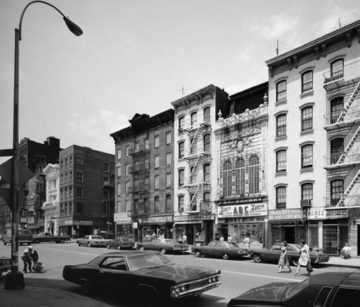 The Grand remained open for 20 years, but not exclusively as a Yiddish theatre. By 1909 it was leased to the Bedford Theatrical Company, and by 1913 it was playing Marcus Loew attractions (moving pictures). The theater closed in 1923, and after sitting vacant for several years, the entire structure was demolished in 1930. The theater was demolished in the wake of extensive neighborhood improvements on the Lower East Side, which included widening both Chrystie and Forsyth Street. As these streets were widened, all of the buildings on one side of the street were demolished, including The Grand. The demolished buildings once sat on the edge of what is now Sara Delano Roosevelt Park. The Loews Canal Theatre, at 31 Canal Street. Note the adjacent signs, which convey the multicultural nature of the neighborhood. Some signs are in Hebrew, while others advertise Chop Suey. Image: Cinema Treasures. The Loews Canal quickly became an integral part of culture on the Lower East Side. 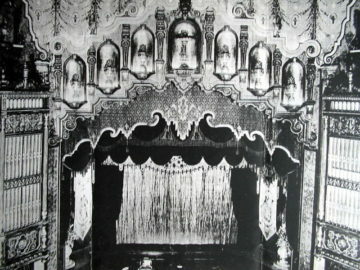 Despite its grand size, the theatre was known for playing “B” list movies and double features. This less expensive entertainment may have been more attainable to the lower class immigrants of the neighborhood, of which there were many. 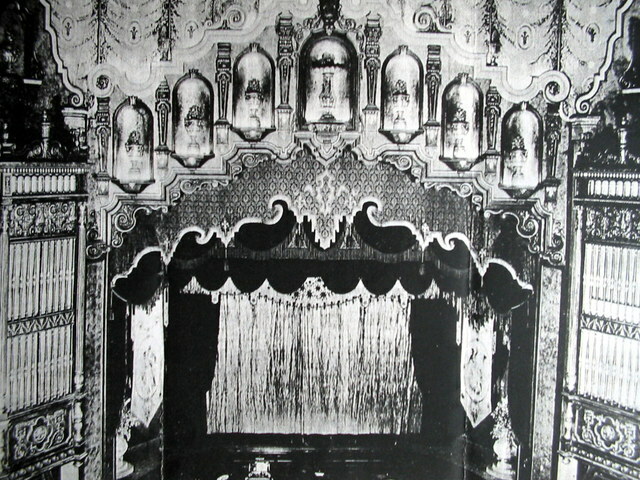 The theatre remained open until the late 1950’s when it was converted to retail and warehouse space. The theatre space, languishing in disuse, deteriorated in those years. Eventually the building became entirely vacant. The theatre’s terra cotta facade was designated a New York City Landmark in 2010, which affords some protection for the building, however it continues to sit vacant. Today, despite its decaying state, the building has become a point of fascination for many New Yorkers. Our Museum at Eldridge Street walking tours stop at the intricate and elegant Landmark facade. There are no current plans for the future of this historic theatre, however the New York City Fire Department has spray painted an X in a square on the facade. This symbol communicates that the building is hazardous and structurally unstable. So no matter how tempting it may be – stay out! The front facade of the Loews Canal Theatre, after it had been converted into retail space, circa 1978. Image: The Museum of the City of New York. 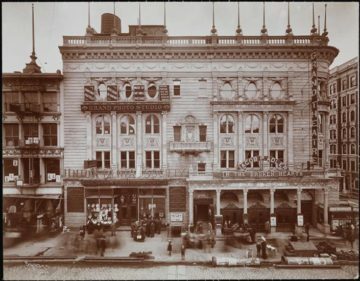 Both of these theatres were important to the culture and daily lives of those living on the Lower East Side during the early 20th century. They provided entertainment for the working-class population, allowing them to escape their difficult lives for a couple of hours. Furthermore, theatres like The Grand specifically catered towards those immigrants that felt more comfortable communicating in Yiddish as opposed to English. Institutions like The Grand show how strong the Jewish community was in the neighborhood at the time, and just how deeply they were able to make the Lower East Side their own home. One of these theatres has been lost to demolition, while the other remains standing today. What will become of the Loews Canal Theatre? Will it end up demolished just like The Grand, or will it be restored or redeveloped? These questions continue to keep local preservationists, and advocates of Lower East Side history on the edge of their seats, eager for theatres next act to unfold. Inside the auditorium at the Loews Canal Theatre during its heyday. Image: Cinema Treasures. Inside the auditorium at the Loews Canal Theatre in 2014. Image: The Gothamist. If you’d like to learn more about what life was like for our child sign worker, and other kids on the job 100 years ago, join us for our upcoming family program History Hunters: A Kid’s Life at Work. Your family will step back in time to learn all about newsies, garment workers, sign painters, and more! You’ll even get to try your hand at a few skills of the trades. See you then!